If you know Danica McKellar, you’re most likely to remember her as an actress in The Wonder Years. 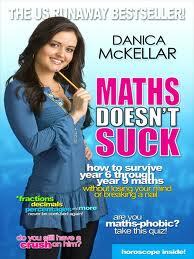 So why on earth has she written a book about maths? And what can a former child star possibly teach teenagers about fractions, decimals, percentages, and the rest? I should point out that it doesn’t cover everything pupils in Years 6 – 9 will need to know in maths (although there are two more books available with a fourth coming out this year, and between the quartet I don’t think they’ll be too far off doing that.) What it does do is cover the number work which pupils constantly find challenging – fractions, decimals, percentages, factors, multiples, and a few others – and the basics of algebra really, really well. In particular, the Birthday Cake method for Lowest Common Multiples and Highest Common Factors and McKellar’s way of remembering the order in which you perform operations are superb, both significantly better than anything I can recall seeing before. One slight moan – I appreciate its aim is to appeal to teen girls and think it does a great job of that. However, I’d have liked a few slight tweaks – at least a few boys commenting as well as the girls, or something – to make it one that boys would be more likely to pick up. The maths involved here is far too useful to not want all students to benefit from it! Very high recommendation as a book which could be, genuinely, life-changing for younger secondary school students who struggle with maths. I bought this one the other day - after having sudden inspiration to refresh my maths skills (no idea where it came from lol) and picked this one - really from the cover (and the sample). And so far I completely agree - I'm very tempted to buy the others too!